Renowned sports artist Dave Hobrecht and Hobrecht Sports Art are honored to present this exclusive limited edition of 250 giclees on canvas signed by Hall of Fame Jockey Mike Smith and Artist Dave Hobrecht. A limited edition of 250 giclees on canvas has been crafted from the original masterpiece. Each 42” x 26” print is signed and numbered by Hall of Fame Jockey Mike Smith and Artist Dave Hobrecht and includes a Certificate of Authenticity. 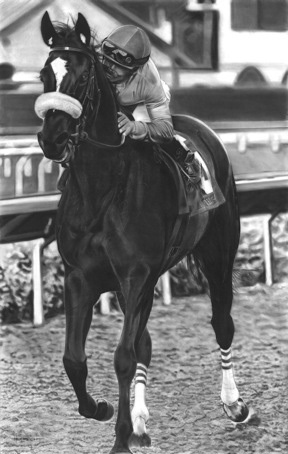 A portion of proceeds will be designated by Team Zenyatta to benefit CANTER, Old Friends and The Race for Education. Can’t afford, but really admire the work. Great job. WOW! Stunning – hard to believe it is an actual work of art! I want!!!! It’s beautiful…thanks for sharing it with us. Wish I could afford this fabulous painting! I will have to settle for trying to copy it by hand with pencil. Zenyatta has such a spirit to her. She loks so graceful and happy as Mike Smith bestows his kiss on her! She is a magical horse. I love her and am so grateful God made her for us all to enjoy. I pray she will make a beautiful foal that looks and acts like her. Not exactly because there is only one original and unique Zenyatta! **Sorry, above comment was posted to this page in error.